Now that we are creeping up on- dare I say it?- halfway through our Year of No Sugar (!!!) there is a very pleasant law of dietary inertia setting in, that is: a person not eating sugar tends to stay not eating sugar. Compared to our shaky beginnings on January first, we’ve acclimated significantly to the challenges of shopping differently, eating differently, and talking to people about it. I still make mistakes, dumb ones, like just the other day when, for variety’s sake, I picked up a package of Applegate Farms organic ham slices at the health food store instead of the usual Applegate Farms organic roasted turkey, without double-checking the ingredients… um, Eve, hel-lo? Still, we’ve gotten to a point where we might be what you’d call… fairly well used to it. To celebrate meeting the nebulous milestone of being “fairly well used to it,” Greta, my eleven year old daughter and I did a short presentation for her fifth grade class which we might’ve titled “Yeah, Like, What the Heck is Greta’s Family Doing, Again?” I was nervous. I realized that for all the talking and reading and thinking and agonizing I’ve done on this subject, I haven’t spoken before a group about it at all. Sure they’re fifth graders, not a congressional inquiry, but nonetheless I had visions of difficult biochemistry questions being lobbed at me by kids who aren’t about to give up their chocolate-covered Twinkies without a fight. Most of all, I worried about the same thing all mothers of pre-teen girls worry about: budding eating disorders. The last, last, LAST thing I wanted to do in the course of discussing important topics like the national epidemic of obesity, was to inadvertently encourage some fifth grade girl not to eat. Have I put enough pressure on myself yet? Just wait till I have to talk to The New York Times– I’ll melt into a little savory puddle on the floor. But I think it went okay, after all. I focused on some key terms and statistics I thought might perk their interest: how every man, woman and child consumes on average 2.7 pounds of sugar per week (I held up a five pound bag of sugar to demonstrate one person’s two week allotment. Interestingly, the kids seemed rather unfazed by this), what a “Western Disease” is (guesses included “pneumonia” and “malaria”- so good we talked about this one), and how doctors decide whether a person is a healthy weight, overweight, or obese. I mean, you hear about an “epidemic of obesity,” but what does that really mean? I put the BMI (Body Mass Index) formula on the board: weight in pounds times 703, divided by the square of your height in inches. Amazingly, the kids really perked up at this. There were sudden shuffling noises as kids grabbed for pieces of paper and pencils, presumably so they could calculate their own BMI, although I have to admit that I wasn’t about to start figuring out what sixty-six squared is on paper. I demonstrated how I got my own BMI by plugging in my own height and weight… and whipping out my handy dandy calculator. The other two most popular part of the hour was more predictable: when Greta distributed my most recent dextrose dessert effort: carob chip brownies. I was delighted to see that everyone ate their entire brownie- which to me equals success, not just for my changed palate, but to kids who may very well view sugar as one of the four food groups. That’s one of the things you can still say about kids at this age- they haven’t learned to varnish their opinions yet in the name of politeness. Most fifth graders aren’t going to eat a yucky brownie just to be polite to someone’s mom. 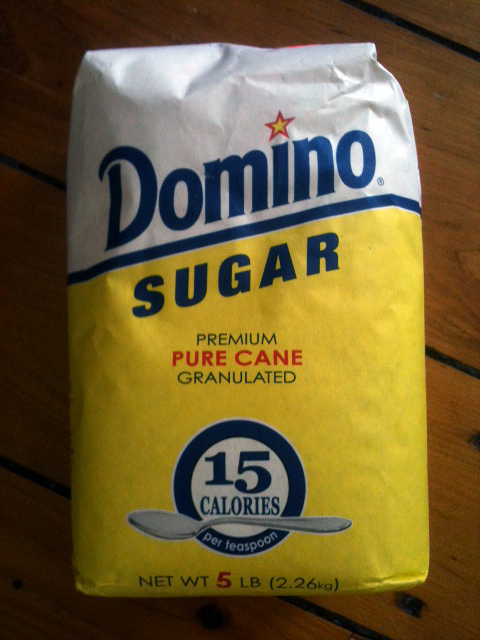 You are currently reading A Year Of No Sugar: Post 54 at Eve O. Schaub.